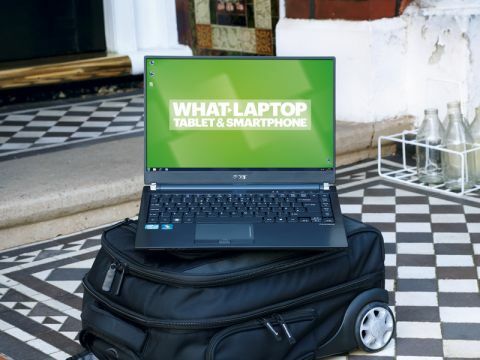 When it comes to battery life, Acer's TravelMate 8481T is the laptop to beat. It's not all that surprising when you see the battery protruding from the back of the chassis, practically doubling the breadth of the machine. But, if you need to pack the TravelMate away, simply unclip the battery and it shrinks from 41mm thick to only 24mm. Our battery benchmark test – supplemented with looped high-def video – took 326 minutes to run down the TravelMate, so we'd expect that this machine would get you through a mains-free eight hour day with standard use. Apart from the battery, there are other features that mark this laptop out as a travel device. Its 14-inch screen dispenses with Super-TFT reflective coating, instead opting for a matt-TFT finish. This means that, while movies and pictures won't look as colourful or vibrant, the TravelMate can be used in bright environments – like airports or train carriages without annoying glare being reflected on the screen. Even with the screen brightness set to maximum, the display is noticeably darker than other laptops. This is an extra way to maximise battery performance, as the biggest drain on any laptop's power supply is keeping the screen bright. There's also a fingerprint scanner nestled between the click buttons below the touchpad, lending saved documents an extra layer of security. Boasting Acer's favoured raised keyboard, typing is also comfortable, thanks to a decent amount of travel, but not without some serious flex. Because the battery protrudes the way it does, you're typing at a raised angle, much more comfortable than on a traditional flat laptop. While we might be tempted to lump the TravelMate in with the Portégé R830 as being eclipsed by the new Ultrabook range, the much lower price and substantial battery life mean there is a case for choosing one of these over an Ultrabook, although the black chassis – while simple – is nowhere near as elegant as the brushed silver of Acer's own S3 Ultrabook. The TravelMate can last so well without mains support partly because the specs inside the machine are configured to conserve power. Although you have a second generation Intel Core i5 CPU inside the laptop, it's limited to running at 1.6GHz (whereas you might expect to see this chip running up at 2.2GHz or 2.4GHz on other laptops). Similarly, you'll only find 3GB of RAM inside the TravelMate, compared with the standard 4GB found elsewhere. The lack of technical grunt on offer doesn't matter too much, given that this machine's primary aim is to provide plenty of battery life for more basic tasks like emailing and office work. Just don't expect gaming or video editing from this machine. This focus on work-based mobility makes the TravelMate easy to pigeonhole. If you're a mobile professional who needs a machine with the best battery life available, this laptop should be your choice. But for most of us, there are other laptops that offer excellent battery life as well as better performance and media capability.